A Satiric Survey of Contemporary American Fiction, and Contemporary America. Both. After much ado over here at Something, we're back with a Mobile Army of: Increased Insouciance! Newly Upholstered Urgency! Meditative Mockery both Timely and Un! Steadfast Resistance and Stain Resistant Steadfasity! Sacrosanct Sarcasm that Seeps from above and Sinks from Below! Fonts! Deep Sympathy! And an Entirely Novel Securities Market, for our Readers on the Rise! Rise!, or rather Consider our Topics which will not be unlimited to: the Rotundity and Flatulence of Character, Being an Enquiry into Whether Characters Are People or Dumb; the Continually Falling Stock of Donald W. DeLillo , whose Falling Man Flutters like an Empty and Falling Shirt--What a Plunk! What a Fluttering Plunge to be Half Dead in an Age You Despise, Mr. D.! You can Cringe a Bit Further and So Do So! ; and you, Mr. S.L.M.N. 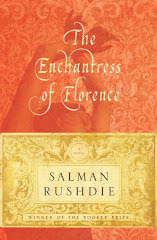 Rushdie, we shall examine You and your Eco-Echoing Prose (prose), So Lemony Many Nights (One Thousand and Few! ), Suns Rising and Passing and Plunging toward Periods, Sentence hounding Sentence, a Daze of Sentences and Monthlong Paragraphs Passing and Lunging across the Sky called That Book You Have Made--but Why! Why the Hounding and Plunging and Passing and Words? Why! ; and Mr. Meandering Bolaño, Mr. Artless Arturo and Mr. Useless Lima, we love you but be forewarned: We Will be All Over Your Shuffle Board Court! ; and furthermore Things! We shall Discuss and Propose and Ponder Things that Exist and Things that Don't, such as a Global Muppet Revolution--It and We are a Call to Arms and Tails and Snouts, a Frenzy of Fur and Fuzz and Funky Funky Junk because we Categorically WILL Freak the Funk and Talk the Most Junk. A Plutocracy of Plurabilities that we will Ponder and Propose and Plunge into Icy Water! Gasp!, or rather Ponder Our Present Topic before it too Plunges towards Punctuation: Flatness and Rotundity, that Smattering of Profundity: When Exactly do Characters Gasp and Awake and Rise from the Page? When do the Neckbolts Spark and Turn Print into Personhood? When do the Eyeshutters Rise and allow in Light; and What Light; and Who Allows It? And What, for example, of Us? Then Even More! Next Time! Right! Here! Hurray! And Scene. 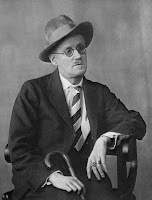 (And thank you, Mr. Joyce. We hope your neighbor quiets down). Basically, we're back, and we're sort of excited about it. PS. 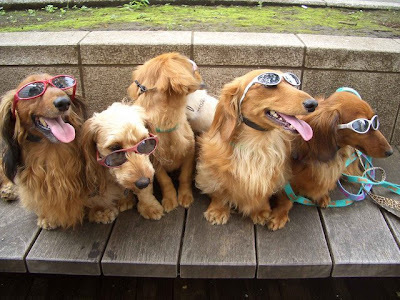 I conned my parents into getting me five new dogs, because it is Summer. So a few of us somehow ended up at the Modern Language Association Convention in Chicago, where we donned disguises and distributed gurrilla-style (OK, gorilla-style: they were gorilla costumes) 1,500 copies of a parody of the Convention Guide. It's called the MLAde, and you can read it online here. Shockingly, the only real backlash seems to have been the Horrible Food Poisoning each of us got on the second to last day. At one point we did see Stanley Fish (pictured at right) sneaking around the kitchen of the Corner Bakery, but we all just assumed that that was something doddering literary critics were allowed to do. Stanley Fish, by the way, has recently lost his mind, as is proven by his recent NY Times columns on the Uses and Abuses of the Humanities. It seems to us that there are any number of ways (hundreds) to critique the way the humanities work, or the way literature or philosophy or history is taught, but Fish's arguments are unworthy of both his previous intellectual standards and of the reading public. Like the passage from the George Herbert poem he "analyzes" in the opening of his essay, his arguments undermine themselves on their own, so we won't waste our time doing so. But here's a theory: the reason Dr. Fish gets to stand on the Enormous NY Times Soap Box, when there are literally dozens of more vibrant and interesting literary theorists out there, is that he confirms anti-intellectuals' (known in academia as "haters," and in Scientology as "SP's" or "Suppressive Persons") poorly formulated suspicions about the usefulness of thinking. Oh Stanley. In the words of Tom Cruise, "I have canceled him from my area." Our good friend Minh, over at his incomparable Bottom Shelf Books, pointed out something else interesting concerning the Fundamental Asymmetries of Fragglenomics: that it works by the manner in which the Fraggles continuously mooch off of and munch on the congealed labor and radish-y infrastructure constructed by the Doozers. This reading adds on yet another layer of allegory to the already seven-layer-dip-ish story of Fraggle and Doozer relations. The allegory is this: the Doozers are the Clintonian democrats who mined the radishes and built a Radish-y Surplus, and the Fraggles are the frenzied neo-conservatives who gobbled up this infrastructure and surplus, invaded a foreign land (Iraq = Doc's workshop), and handed us and our grandchildren the LARGEST DEBT IN WORLD HISTORY. Weirdo Helper#1: "It's the end!" Trash Heap: "Nonsense, Gunge, it's hard to kill a Trash Heap... It could change a person, it could change me for ever." Weirdo Helper#2: "But what can we do!?" 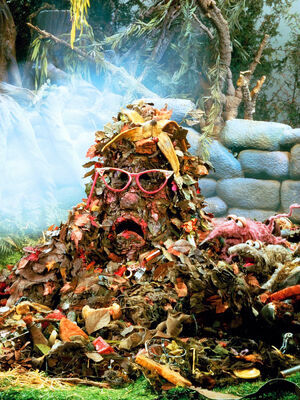 Trash Heap: "Bring me some Fraggles. Let them be the heroes... Why not? Take the right Fraggle, put him in the right place--he might rise to greatness. Weirdo Helper#3: "How do we know when irrational exuberance has unduly escalated asset values, which then become subject to unexpected and prolonged contractions as they have in Japan over the past decade? Weirdo Helper#2: "It's the end!" Greenspan: "Indeed, the sharp stock market break of 1987 had few negative consequences for the economy. But we should not underestimate or become complacent about the complexity of the interactions of asset markets and the economy. Thus, evaluating shifts in balance sheets generally, and in asset prices particularly, must be an integral part of the development of monetary policy. Bring me some Fraggles." Plus, just look at the huge glasses! A Fraggle Is Haunting Europe... the Fraggle of Communism! Speaking of Muppets and the contemporary exploitation of indentured servitude by the so-called "knowledge-classes," what about the Fraggles' unending oppression of the Doozers? I can't think of a more concise example of a knowledge-class (the mystical Fraggles who "live to play") extracting the congealed labor ("Doozer sticks") of an underclass (the hard-working Doozers). The Fraggles literally gobble the labor up. 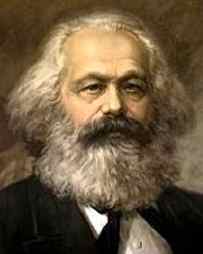 Just listen to Jim Henson's description of the system of oppression--he's like a wackier incarnation of his bearded brother, Karl Marx. And yet he seems to accept the system of exploitation as unavoidably rooted in some sort of alleged naturalism: "Doozers live to work." Clearly Henson subscribes to Fraggle-mysticism. In other words, we know what side he's on. Perhaps a re-reading of Fraggle Rock is the most urgent thing Cultural Theorists could be doing. Donald Hipsterdoofus, here, albeit reluctantly. Once again, from my painter's loft in Silver Lake, I am forced to provide the missing allegory for the contemporary exploitation of the proletariat by the Regime of Knowledge. I am, after all, an ex-graduate student who worked for what amounts to bee-wages. So: here is the video for Menomena's "Evil Bee"--I think that the immediate and direct relation between this video and graduate student labor should be self-evident--(the crow-mobiles powered by bee-barf, for example, are obviously the Junior Faculty of a Comparative Literature Department, and the poor bees are overworked grad students--but once again, all of this is self-evident). Clearly this is the allegory the previous poster (Tamilda, ahem) was looking for. I suppose the state of Contemporary American Fiction doesn't seem so dire when viewed in the context of The Story of Stuff. A few minutes in, at about the part where she begins discussing quote unquote Externalized Costs, I began, moderately, to freak out. I like the way Annie Leonard shifts this notion from being simply the burden of corporations (it's they who are externalizing costs for their profit) to being our burden (it's our costs that are displaced into and diffused through a global system of waste and oppression). This can only happen, naturally, through the efforts of huge corporations to increase their profits, but in Leonard's formulation WE too are the direct oppressors. I'm not sure I've ever seen it expressed as clearly as it is in this movie. Sick with the din and soiled with the mud of Fleet Street -- where the Benedick tradesmen are hurrying by, with ledger-lines ruled along their brows, thinking upon rise of bread and fall of babies -- you adroitly turn a mystic corner -- not a street -- glide down a dim, monastic way flanked by dark, sedate, and solemn piles, and still wending on, give the whole care-worn world the slip, and, disentangled, stand beneath the quiet cloisters of the Paradise of Bachelors. This is what externalized cost aims to do--to slip out of the "din" and "mud" of the real world and into a simulated one. 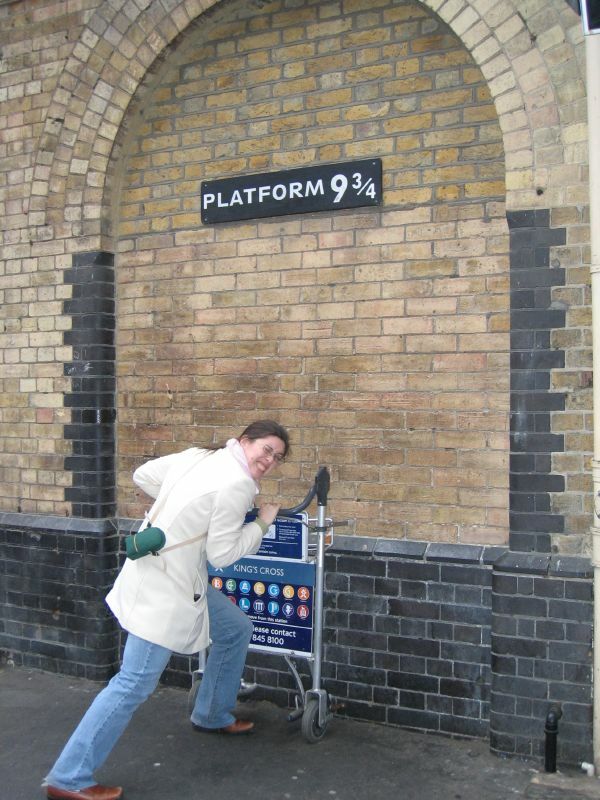 Like Harry Potter worm-holing to Hogwarts. Problem is, you can only worm-hole for so long--pretty soon that woman on the right is going to run at that brick wall and bounce back. (Worm-holing, I hear, takes tremendous amounts of electricity). The CTBC claims that e-waste accounts for approximately 40 percent of these three toxins [mercury, cadmium and lead] that end up [sic] landfills, noting that "just 1/70th of a teaspoon of mercury can contaminate 20 acres of a lake, making the fish unfit to eat." Maybe those Gigantic Feral Infants from Infinite Jest aren't too far off. The problem, of course, is not merely our essayists; it’s our culture. We have grown terribly—if somewhat hypocritically—weary of larger truths. The smarter and more intellectual we count ourselves, the more adamantly we insist that there is no such thing as truth, no such thing as general human experience, that everything is plural and relative and therefore undiscussable. Of course, everything is plural, everything is arguable, and there are limits to what we can know about other persons, other cultures, other genders. But there is also a limit to such humility; there is a point at which it becomes narcissism of a most myopic sort, a simple excuse to talk only about one’s own case, only about one’s own small area of specialization. Montaigne thought it the essayist’s duty to cross boundaries, to write not as a specialist (even in himself) but as a generalist, to speak out of turn, to assume, to presume, to provoke. “Where I have least knowledge,” said the blithe Montaigne, “there do I use my judgment most readily.” And how salutary the result; how enjoyable to read—and to spar with—Montaigne’s by turns outrageous and incisive conclusions about humankind. That everything is arguable goes right to the heart of the matter. I'd argue that this is sort of the case of Contemporary American Fiction, and perhaps also Contemporary American Poetry, and maybe even Contemporary American Politics (at least on on the Left, though this is changing). Big Claims/Ideas/Opinions/Ambitions are associated with Big Stupidity... which is generally a fair assessment: things do tend to be far more complicated than, say, Karl Rove lets on. Invading and occupying Iraq, for instance, is now sort of universally acknowledged to have been a Big Stupid Idea, and needed to be thought through in a way way more nuanced manner. In itself this, however, doesn't mean a) that there aren't Big Ideas that are true or, more importantly, b) that posing nuanced rhetorical points in the guise of Big Ideas / Claims / Statements doesn't have some sort of big payoff, even if those Big Ideas are revised / undermined / deconstructed / found to be utterly false and stupid in the process. But at least in that case you have people's attention... Gomez Addams is the most important American Intellectual of the 20th Century! See? This claim is false (the most important American Intellectual of the 20th century is clearly Frasier Crane), but at least I have your attention. And I'm actually sort of serious about Frasier--Frasier Crane was the Clinton-era image of what an intellectual is (snooty, effete, urban, bi-coastal, bi-curious (? ), cheese-eating, nauseating, utterly horrible), an image turned against the Left by Rove and our Cowboy President in the 2000 and 2004 elections. Look, for instance, at this picture of Frasier pompously lecturing Eddie-the-Dog on the historical determinations of liberal bio-politics and how it caused Hilary Clinton's 1994 proposal for universal health care to self-destruct in the face of the slanderous attacks of Rush Limbaugh. Who would you side with in this debate: the pretentious and boring and weird-looking Frasier (the liberal intellectual), or the cute and likable Eddie-the-Dog (who is, by analogy, conservative)? Is it any coincidence that Kelsey Grammer is Completely Conservative? Is it totally paranoid to think this? Is it utterly paranoid to have written an all-but-completed 722 page PhD dissertation applying the theoretical work of Giorgio Agamben, Jacques Rancière and Ernesto Laclau to Frasier, Seasons 3-6? But let's move on. When Nehring says that everything is arguable, she is admitting that everything is rhetorical. It strikes me as odd when people (rightly or wrongly, from a scientific standpoint) apply the analogy of Heisenberg's Uncertainty Principle (that the act of measuring fundamentally alters what's being measured) to language and the things that human beings do in the world, and immediately retreat, as though what's being measured were something Sacred. Of course, sometimes that thing being measured IS sacred and worth preserving (e.g. a culture being prodded by anthropologists). But in a society like the U.S. where everything has always already been tampered with, things (the sorts of things you'd write an essay about) aren't sacred--they're determined by the manner in which we frame discussions around them. That's why Nehring's essay is so great--because she pinpoints the fact that our discussions / analyses / narratives about most things are unbelievably timid and gentle and wimpy. I'd argue (hell, I AM arguing) that the indirect effect of this timidity is an unconscious reverence for the object being discussed. And what is unexamined reverence for what exists if not Conservatism? Something Under the Bed Is Writing? Huh. What's It Writing? Well, it's apparently writing this blog. 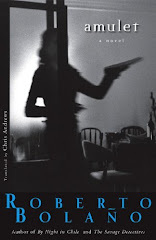 And this blog... this blog begins with the hypothesis that there is something deeply wrong with Contemporary American Fiction. That it is tragically anemic, or at the very least that it is suffering. Unnecessarily. The goal of this blog is either to a) prove that hypothesis wrong; or b) mock that suffering. We're not sure which. How could C.A.F. have something "wrong" with it? How could it "suffer" or be "tragically anemic"? We're not really sure. What if we changed it to: This blog begins with the hypothesis that there is something Deeply Weird going on in Contemporary American Fiction. Would that be better? OK, phew. Basically what we do here is we write book reviews. And sometimes reviews of other things, like movies, or TV shows. And sometimes we just write about things that strike us as interesting or annoying. Like each other. Us, the reviewers. There's a bunch of us. We all have nothing in common except that everyone who writes for us hates each other. (Except for Donald Hipsterdoofus and Richard Schmooze, who are friends, and Tamilda the Genius 10yr Old and Percy Bysshe Shelley, who are on the same t-ball team). Christianne Alarmist-Librarian: Fundamentalist Christian Alarmist Librarian living in Hanover, New Hampshire. The sky is falling! Hooray! by Ernesto Laclau... one of the best books on political theory I've read in a long long time. It makes sense of both political philosophy (e.g. Rousseau's social contract) as well as of the contemporary American political scene, though he does not reference it directly. Basically: read it. Something Under the Bed Is Writing is, yes, a tribute to Bill Watterson's Calvin and Hobbes, whose second book is called Something Under the Bed Is Drooling. Are we deliberately trying to draw a comparison between writing and drooling? Are writers nothing more than drooling monsters? You tell me. I mean us.